With songs that range from folk to pop to boot-stompin' roots rock, Every Soul's a Sailor features a lush, propulsive sound that draws in the listener with an almost hypnotic effect. For Stephen Fearing, multiple JUNO Award winner, international touring artist, and founding member of Blackie and The Rodeo Kings, a cross-Canada relocation (from Halifax, NS to Victoria, BC) kicked off a period of reflection that inspired the songs which became Every Soul’s a Sailor, his ninth solo record. While they span a range of musical styles from folk to pop to boot-stomping roots, the tracks share a common focus – the value of The Journey; the various paths we take in love, life, and even after-love, and the after-life. From the late-night introspection and driving beat of Put Your Money Where Your Mouth Is, asking listeners to reflect on how life’s energies were spent, to the haunting and ethereal Gone But Not Forgotten, featuring guest harmonies by Rose Cousins, the record gave Fearing the opportunity to blend his musical realms. “I have travelled consistently between the two poles of solo and ensemble work. With this album I wanted to see if I could bring those two worlds together in the studio and then out on the road,” he explains. This sonic blend created an ideal environment for Fearing’s first (in a long time) straight-up protest song, Blowhard Nation. As a spectator of Donald Trump's con-man campaign of hate and fear, it came from a place of humour and sarcastic outrage and ended up a Merle Haggard-inspired roots rock anthem that leaves you wanting to two-step straight to your local tavern. Together with Craig and bassist John Dymond, both of whom Fearing has worked with extensively over the past 20 years on solo projects and as the rhythm section for Blackie and The Rodeo Kings, they created a lush, propulsive sound that draws in the listener with an almost hypnotic, effect. There are plans for Dymond and Craig to join Fearing on the road for select concert dates. 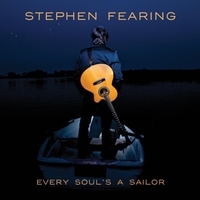 Every Soul’s a Sailor is Stephen Fearing’s ninth solo album. He is a founding member of the Canadian super-group Blackie and The Rodeo Kings. Over the course of his celebrated career he has collaborated with a long list of artists including: Nick Lowe, Shawn Colvin, Richard Thompson, Pam Tillis, Bruce Cockburn, Sarah McLachlan, Tom Wilson, Colin Linden, Margo Timmins, and many more.